page-2- carefully scrutinize the students participating in such demonstrations, and will place any from their districts at the top of their draft lists with no consideration for educational exemptions. I am sure that the mothers and fathers of our boys in Viet Nam will endorse such a policy. Thirdly, it is also hoped that our state administrators and low enforce-ment officers will strictly enforce our civil laws, and stop this disloyal cancer before it results in complete civil strife. Let us keep our educational institutions for the benefit of those who seek an education, and not be used for political or disloyal mob activities. 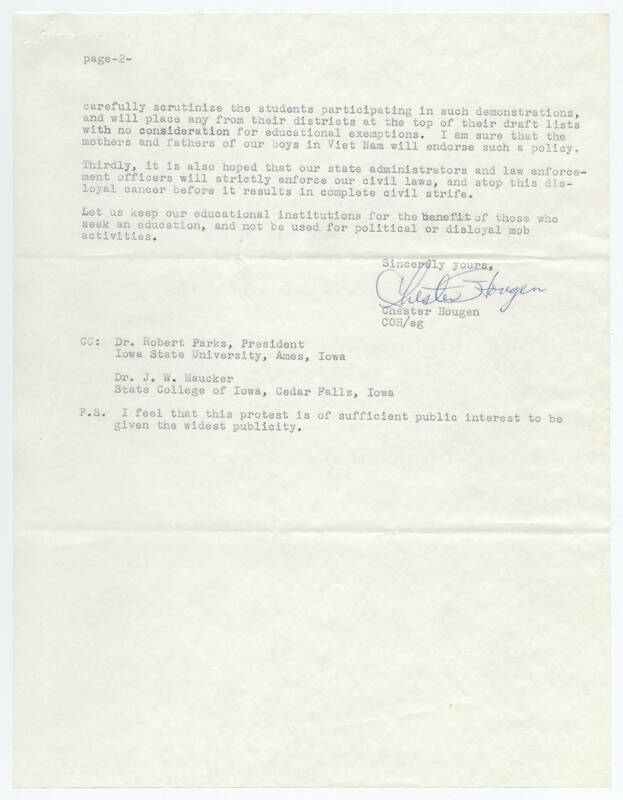 Sincerely yours, Chester Hougen COH/eg CC: Dr. Robert Parks, President Iowa State University, Ames, Iowa Dr. J.W. Maucker State College of Iowa, Cedar Falls, Iowa P.S. I feel that this protest is of sufficient public interest to be given the widest publicity.